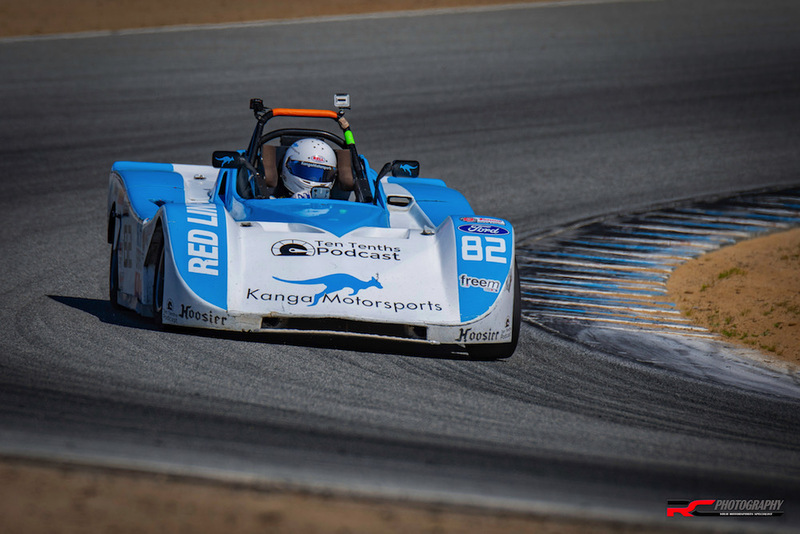 The Spec Racer Ford is one of the most popular class at Sports Car Club of America (SCCA) race weekends. You will often see groups of these race cars buzzing around the race track together. But why are they so popular? With over 900 cars built and over 400 actively racing around the United States there are often big fields of cars especially at large events on either the West or East Coast. We have seen fields of 60+ cars take to the track with an average West Coast race weekend seeing 20+ cars. This means no matter how fast you are there is always someone to race. The class has a long running fixed rule set. Since the rules are not constantly changing, you do not have to spend more money on the latest go fast parts or worry competitors are exploiting grey area loop holes. This allows you to focus on your driving and race craft. To ensure an even playing field and parity between the cars they use specification parts and sealed components, including the engine, transmission, shocks and ECU. This ensures that cars have similar performance capability and makes for exciting wheel-to-wheel racing with an emphasis on driver skill. Since the cars are so equal it is possible to simply rent a car and still win the race. The Spec Racer Ford is a single seat, open cockpit rear drive racecar. Built for racing unlike other production cars that are repurposed for racing. The advantage is that the suspension has very little compliance using solid bushings, rod end bearings and adjustability built into the suspension links. Featuring Penske rebound adjustable coil over shock absorbers, independent rocker arms and tunable lower A-arm suspension. Designed for easy access the car is adjustable for ride height, castor, camber, toe, rebound and sway bars on all 4 corners allowing the driver to tune the car to their driving style and track conditions. Safety features include integrated fire suppression system, ample crush zones and a full tube frame chassis with roll over hoops. Drivers equipment includes 6 point harness, Helmet, head & neck restraints, full fire retardant clothing (shoes, socks, underwear, drivers suit and gloves) plus arm restraints in case of a crash or roll over. The cars have a minimum weight of 1560 lbs (707 kgs) with driver, pushed along by a 1.6L Ford Sigma motor tuned to ~135 hp, 118 lb-ft torque. The cars are a fantastic training tool for new and experienced drivers. With low horsepower you can’t just jam the throttle down to make up time when you loose speed due to a driving mistake. With low weight and Hoosier racing slicks these race cars are quick through the corners, you will often see them catching and passing other cars in the corners during test days. Driver skill, fast lines, smooth inputs and high corner speeds are rewarded with quick lap times. The Spec Racer Ford uses lightweight three-piece fiberglass bodywork. The body work is easily removable providing quick access for suspension adjustments, trackside maintenance or repairs. The fiberglass can also be simply repaired with mesh and resin unlike more exotic materials like carbon fiber or carbon-kevlar which use vacuum forming and/or an autoclave. You can even perform quick trackside repairs after an incident to get back out on track for the next race of the weekend. Budget and affordable are relative terms, motorsports in not the cheapest sport but you also don’t have to rob a bank. The operating costs of the Spec Racer Ford is relatively modest with the greatest portion of most amateur racers budget dedicated to tires. The annual operating costs can be kept low with regular maintenance, motors can last several seasons and wear items (brakes, fluids, filters, spark plugs and spare parts) are budget conscious. The car was also built with the amateur racer in mind meaning a privateer can do the majority of work themselves either trackside or in the comfort of their garage. The Spec Racer Fords have tremendous trackside support with a network of Customer Service Representative (CSR) throughout the United States that attend local and national SCCA events to provide help, spare parts, preparation and even rental cars for drivers. This level of track side support means you don’t have to scrounge for spare parts and your race weekend won't be ruined because you can’t find a specific part for the car, even at the more remote tracks. You can even just be an arrive and drive racer showing up only to race with a CSR or prep shop taking care of the car, towing and any repairs for you. The Spec Racer Ford community is very welcoming to new drivers and willing to help. Experienced racers will even provide driving tips and data for new drivers to help them get faster. Since it is all about the racing you will even see fellow competitors helping each other fix or rebuild cars trackside just so they can compete with them in the next race. So if you are looking into wheel to wheel racing the Spec Racer Ford might just be the right car for you. Go ahead rent one and give it a try? Want more Motorsports Articles straight to your inbox sign up for our Monthly Newsletter.